Happy Halloween season! 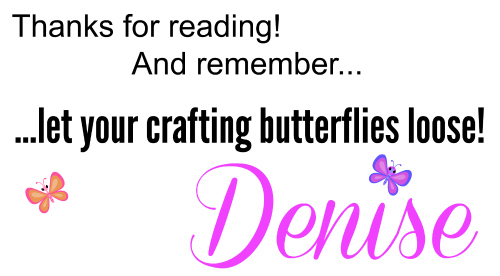 I have a super cute upcycle project for you today. 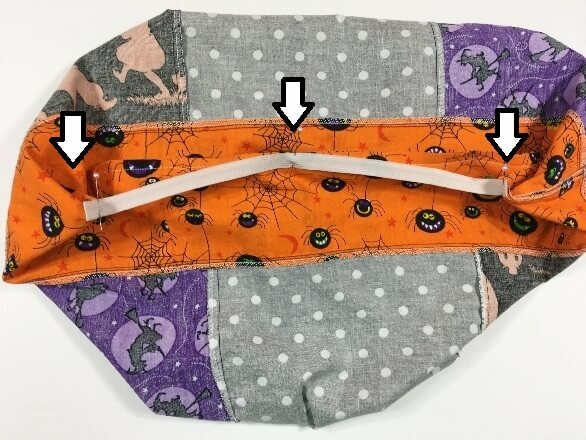 This DIY Halloween Candy Bag was a skirt! Yes, it used to be a pretty skirt I made for my daughter some years ago. I never wanted to part with it. 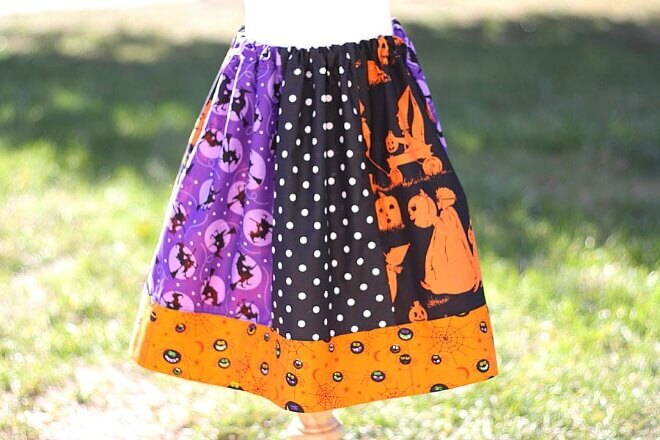 The fabrics I used for this skirt are so pretty and not available anymore. 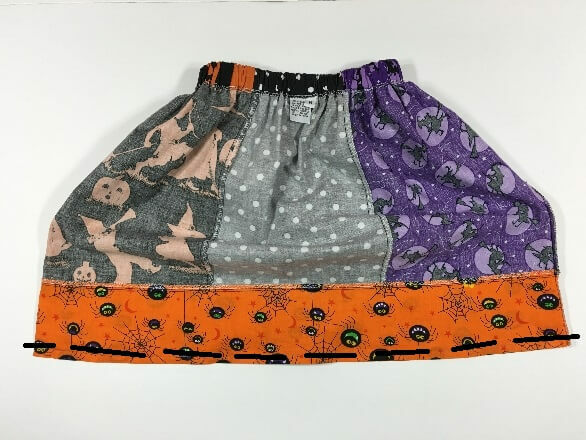 My daughter had this custom made Halloween strip work skirt in a size 6 and I had this fun idea of making a bag with it! Ha! That sounds like a really crazy idea but the bag is now usable for Halloween seasons to come. Plus I used an old cloth belt my son wouldn’t wear anymore. It is a completely thrifty project! 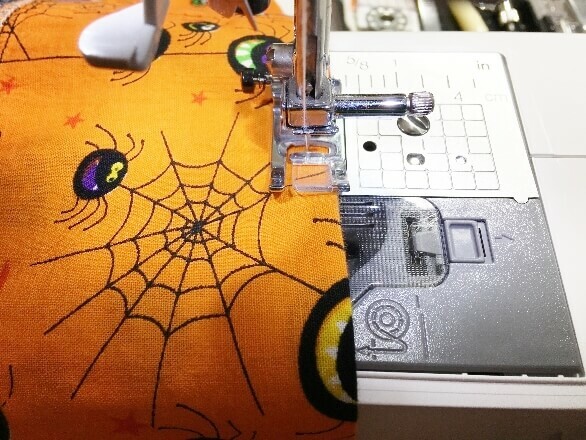 This post is part of an awesome Halloween Bag-a-palooza so be sure to check out all the other great bag sewing tutorials! Here is my pretty skirt from years ago. First, turn the skirt with wrong sides out. Sew the bottom hems together. Cut a piece of elastic half the length of the skirts’ width and pin both ends to the skirt corners and the center of the elastic to the center of the skirt. The elastic will pull the skirt together. This step is shown in the video above. Sew the elastic down by stretching it over the skirt fabric. Backstitch the beginning and the end. This is now how the skirt looks like. Nicely scrunched up and it resembles more and more a bag. Take the belt (or use the luggage/bag ribbon from the craft store). 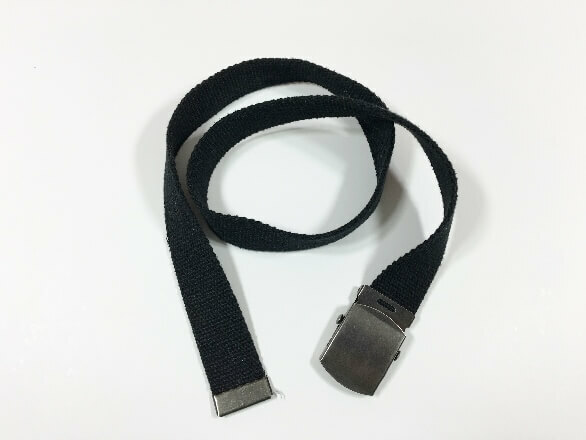 After the belt buckle and end piece have been removed, trim the belt to the desired length. Mine is about 28″ which makes a nice handle to carry the bag over my now 10 year old daughter’s shoulder. I even like the way the bag sits on my shoulder. Pin and sew the belt ends to either side of the skirt (on the inside). Use fraycheck to seal the cut ends. 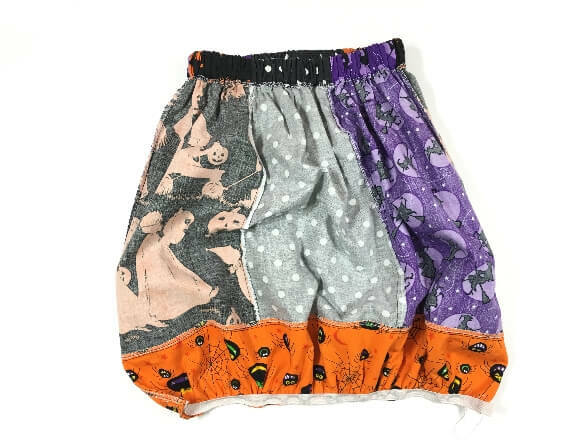 And the repurposed skirt is now a Halloween treat bag! Or a bag for everyday during Halloween season. I hope you enjoyed the DIY Halloween Candy Bag and will subscribe to many more such posts! The subscription box is on the right sidebar! ======> See more great Halloween tutorials and DIY inspiration <===== click this link! What a fabulous idea for repurposing old stuff! Such a cool idea wish I had kids to try it with. Glad you like it! Yes, it will work with a shopping bag to turn it into one with an elasticized bottom.